Have a Droid X or Droid 2? You Can Have Gingerbread Now! "Is your Motorola Droidphone hungry for some Gingerbread? Well, the lucky little guy can now get its taste with the recently released Android 2.3 builds for Droid X and Droid 2 from My Droid World. 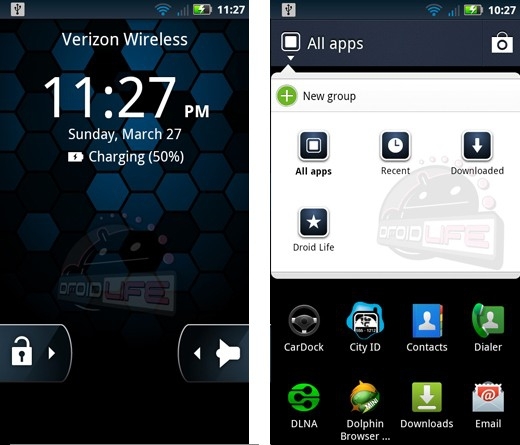 Droid Life's got all the details, including a hands-on video (provided after the break) and complete instructions for rooting your device and downloading the OS." Motorola has a pretty good track record of getting OS update out and it looks like they're keeping up their development work. Android 2.3, Gingerbread seems to be nearly ready, if not completely finish, for the Droid X and Droid 2. The build has leaked out and you can install it on your phone now if you want! I'm excited about Gingerbread not just because of what Google is bringing to the table in it but also because of the many changes that Moto made to the Blur UI. As you can see in the screen shot you can now create groups in the app tray. It also gives you four buttons at the bottom of the home screens instead of three (phone, app tray, contacts) and three of the four can be changed to anything you want! There's more but that's what got my attention. Have any of you installed the leaked Gingerbread update? How's it working for you?